Marc McNulty believes Pompey’s players underachieved by not winning a place in League One. Yet he is adamant the talent remains to finally successfully execute their escape next season. For the second season in a row the striker suffered heartbreak at the semi-final stage of the play-offs. Last term it was with parent club Sheffield United against Swindon in a League One head-to-head. 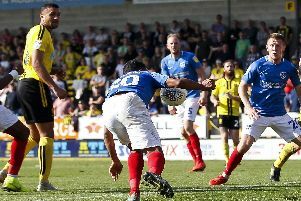 This time round the agony was even more painful for the Blues loanee after Pompey endured elimination at Plymouth in stoppage-time. McNulty has now returned to the Blades, where he has a year remaining on his contract. The 23-year-old told The News of his willingness to return to Fratton Park on a permanent basis. Irrespective of that outcome, he has backed Paul Cook’s team to significantly improve on their sixth-placing next term. He said: ‘I am still gutted about the Plymouth defeat, it goes through my head every day whether I could have done more. ‘It was obviously not to be, we should have done more in the first leg to put the tie to bed but didn’t. Then Plymouth did what they needed to win the tie. ‘I lost in the semi-final last season and it was not nice to take, but losing against Plymouth was a bit worse. Happening in the last minute is the most horrible way to go out. ‘As a team and, individually, that day we weren’t quite at it for whatever reason and it wasn’t to be. ‘We should have gone on, the boys have got to admit we have underachieved. ‘The squad we have, the players we have, myself included, we should have done better. Even if that wasn’t going up automatically we had the chance in the play-offs. ‘Over the two legs we fancied ourselves and were very confident in doing it, yet that was not the case. ‘I would definitely use the word “underachieved” about the season. ‘But next season they will go up. This has been a new team, it is not going to happen that the manager comes in and, bang, it clicks. Next year is the one. ‘The manager, who is a different class, will bring in a few more signings and I think there’s a great chance Pompey will not just get promoted but win the league. ‘There is no doubting where the club should be and it is definitely not in League Two. McNulty finished as top scorer for the Blues with 12 goals during a productive loan spell. He established himself as a popular figure at Fratton Park, among fans and his team-mates. ‘The dressing room was absolutely dead after the Plymouth game, not a peep,’ added McNulty. ‘The chairman came in and was trying to lift the boys up, but obviously everyone was gutted. On the bus journey home very little was spoken the whole way. ‘We had a very, very close changing room, everyone gets on, the partners get on, too, there is a very homely feeling.